The Rosemount 3051SFA Annubar Flow Meter is a no-equal solution with a patented, averaging pitot tube that delivers superior measurement accuracy over a wide flow range. 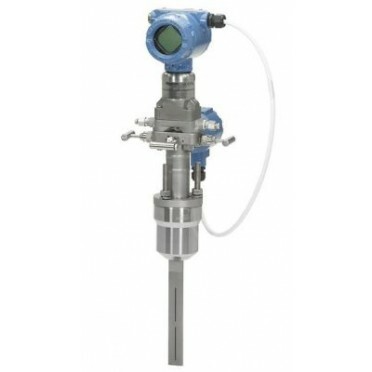 This flow meter can measure multiple variables and is engineered with an integrated thermowell for temperature measurement. Its patented T-shaped sensor is capable of obtaining measurements via a single pipe penetration while maintaining a small profile in the pipe to reduce permanent pressure loss and increase energy savings. Features :Directly mountable on cylinder/valve portsCan be rotated by 360 degreeFine regulation of a.. Description :The EJA-E series of transmitters is Yokogawa's most recent evolution of the DPharp fami.. Description :The YTA610 provides high accuracy, stability, and reliability. The housing structur.. Measuring Principle :High frequency microwave pulses are coupled on a cable or rod and guided along .. Description :The high performance wireless absolute and gauge pressure transmitters EJX510B and EJX5.. Description :The Rosemount 3051S Coplanar Pressure Transmitter is designed with the patented Coplana.. Description :With the Rosemount 2088 Gage and Absolute Pressure Transmitter, you can keep on schedul.. Description :Easy-to-install and designed to deliver industry-standard performance, the Rosemount 20..